Ah Saturday. It’s typically my day for getting stuff done as my wife sleeps off her overnight shift at work. And that day’s errands started with a trip to Home Depot and Microcenter. At Home Depot, I bought the M3 screws I needed to mount the radiator to the case and some additional tubing that I didn’t actually need in the end – but I’m hanging on to it anyway because I know I’ll need it eventually. Following that was a trip to Microcenter where I bought some additional fittings along with a couple PCI-e power extension cables – the power cables coming off my wife’s power supply would fit, but they did look a little ugly and I wanted to dress things up a little. After getting home, I continued work on the loop, starting with the graphics cards. I knew that before I could really get a full idea of what would be involved, I needed to see how the graphics cards would look with the water blocks and sitting in the computer. The water block installation actually went fairly quick and uneventful. One thing that helped is the groove in the underside of the block for the T-line of capacitors and inductors (picture below). To line that up, I worked to align the graphics card to the water block, not the water block to the graphics card. By that I mean I had the water block laying on the table with the contact plate facing up, then positioned the card over that. It was just a matter of getting the capacitors and inductors into the groove, and that had me pretty spot on with the screw hole alignment. Plus as the graphics card was lighter than the water block, it was much easier lining up the graphics card to the block than the other way around, and I recommend doing that for installing the water block where possible as it’s just much easier. 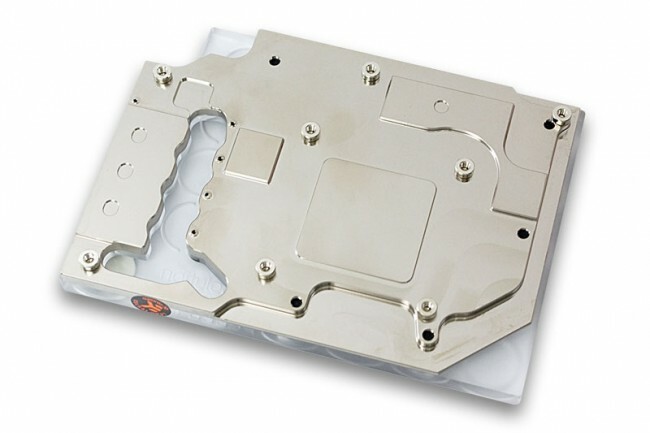 And just as under the CPU block, I used Innovation Cooling‘s IC Diamond compound on the water blocks. Now the way I had actually planned the loop was to use 90-degree fittings between the two cards, not any kind of SLI bridge or Bitspower Crystal Link. Yeah it looks ugly, but I was still kind of going for function over form here, and this was relatively easy to put together. And when I had everything in place, it made putting together the rest of the loop relatively easy – even though it still took several more hours. 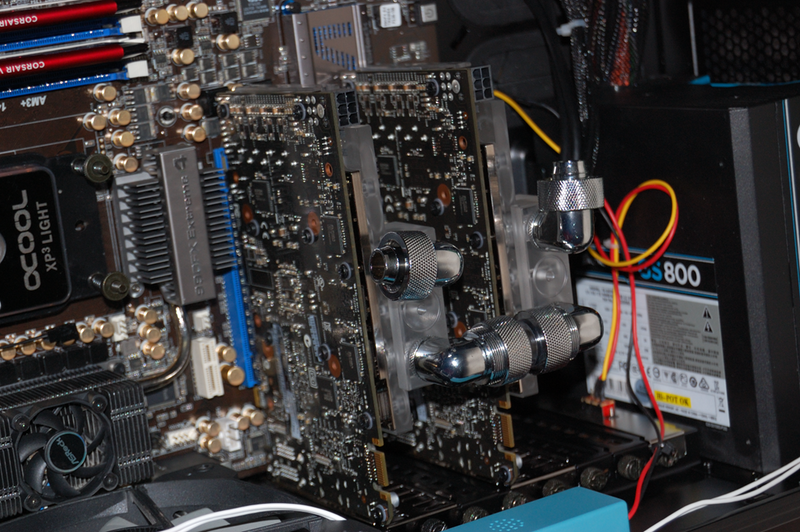 One thing I had planned from the outset was a drainage system for the loop, comprised of a Bitspower valve on a T-fitting between the pump and the graphics cards. 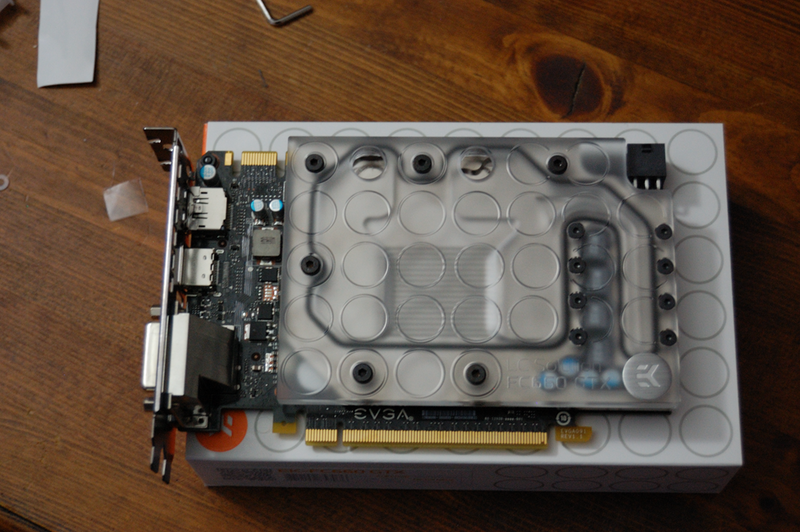 And from the pump to the graphics cards, the line went through the T-fitting to a 45-degree fitting tubed up to the 90-degree fitting on the graphics card water block. And the outlet from the reservoir went down into the top of the reservoir. After that was the leak test and padding down everything with paper towels just in case there is a problem. Unfortunately I don’t have any pictures of the initial leak test, so I’ll just have to describe it. First, I didn’t mix up any coolant. I used only distilled water for the leak test: the water was only 90 cents per gallon at my local Wal-Mart, while the coolant was $12 for 150mL concentrate. Plus I could always go get more water if I needed it, while I’d have to wait for an order of the concentrate to arrive, even if I overnighted it. So for building a loop, if you’re new to this like I was, use distilled water to do your initial leak test. Not only will you be testing for leaks, but it’ll give you a chance to test your drainage system as well – provided you actually installed one into your loop. And part of testing your loop should be doing a test drain on it as well. So how did the leak test go? Umm… not good. For one, I forgot to double-check all of the fittings before I started, and the fittings on the graphics cards had come loose, leading to a major leak. Rather than tighten the fittings, though, I decided to just pull it apart. The extent of the leak meant the cards need to come out anyway so they could be dried off and left to sit for a complete dry. And instead of planning to reassemble the graphics cards fittings the way I initially ran them, I decided to do what I should’ve done in the first place and order the EK SLI bridge. I probably could’ve made the fittings work, making sure to use a pair of needle-nose pliers to ensure they were tight, but in the end it also wouldn’t really have looked all that great. 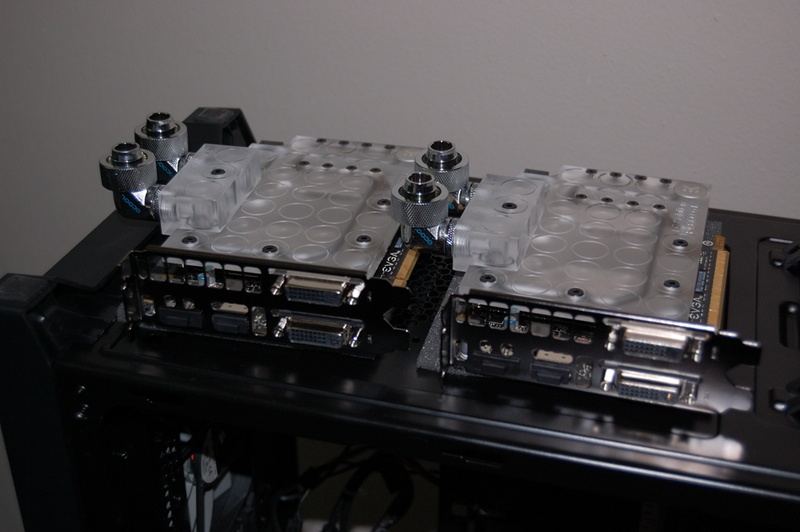 So I ordered the 3-slot dual SLI bridge, serial instead of parallel. As this would change the way the pump is tubed into the graphics cards, I also ordered a couple spacer fittings to redesign how that was tubed up. There were problems with how the tubing was run from the pump to the graphics card as well that resulted in a small leak. So all of this was certainly for the better. The new order was overnighted from Performance-PCs. It shipped out the following Monday, which gave everything plenty of time to dry out before I picked up the package Tuesday night from my local FedEx Office.